New Jersey's Rutgers University recently installed what is said to be the largest solar energy facility constructed on a single U.S. campus-at 1.4 MW-and there could be more alternative energy to come in the near future for the university. The solar farm at Rutgers (top) is made up of over 7,000 panels and is located on seven acres on the university's Livingston campus in New Jersey. Spring sees graduation ceremonies at university campuses all across the country. This past April, however, Rutgers University held a ceremony of a different sort: instead of graduating students, this ceremony was to celebrate the university graduating to a whole other level of alternative energy. The university "flipped the switch," and turned on the nation's largest solar energy facility constructed on a single U.S. campus. 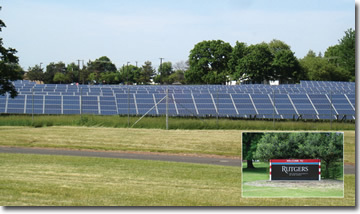 The solar farm at Rutgers is made up of over 7,000 panels and is located on seven acres of the university's Livingston campus in New Jersey. Although the project came together quickly once construction began, the process was about four years in the making. Rutgers has had a long-standing commitment to sustainability, long before "going green" was in vogue. So when the university's energy costs continued to rise with no end in sight, it began searching for solutions, in particular those involving alternative energy. really bring down or make a difference in the cost of our energy," says Antonio Calcado, Rutger's vice president of Facilities and Capital Planning. The solar project makes good sense economically and environmentally, he says. The solar array is expected to generate more than 1,500 megawatt hours of electricity in the first year, offsetting the need to purchase power from local utility Public Service Enterprise Group (PSEG) or draw on the capacity of the university's gas and oil-fired cogeneration plant. The 1.4 MW solar farm is expected to meet about 10 percent of the university's energy needs, saving them in the neighborhood of $300,000 annually by the end of the 15-year program. The university team began researching all sorts of alternative energies, including geothermal, solar power, and wind power. They found alternative energy appealing on two levels-the sustainability factor, as well as the possible cost savings they could achieve by partnering with the New Jersey Board of Public Utilities (BPU). Solar turned out to be the best fit for the university, and Rutgers began working with the BPU to see what could be achieved. "The project just got a little bigger and a little bigger, until we could literally maximize both the dollars available and the seven acres of land that we had," says Calcado. 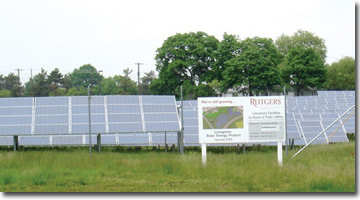 The solar farm became feasible once Rutgers could (in addition to receiving rebates) capitalize on the BPU's Solar Renewable Energy Certificate (SREC) program. Essentially, by statute, power providers in the State of New Jersey must produce a certain quota of green power. If they can't meet the established quotas, they must buy green power certificates. The catch is they can only buy certificates from facilities producing green power in the State of New Jersey. Rutgers found that the certificates were a lucrative proposition because not only were there few companies providing green power in New Jersey, there were even fewer projects as large as what the university was proposing. The university was building one of the largest solar farms in the state, set to produce 1.4 MW annually. The university estimated the 1.4 MW would meet about 10 percent of the university's energy needs, saving them in the neighborhood of $300,000 annually by the end of the 15-year program. And because of the SREC program, they will be able to pay off the $10 million project (approximately half of which the university financed) in about six years. While saving money, the solar project would also reduce the university's carbon dioxide emissions by more than 1,200 tons a year. 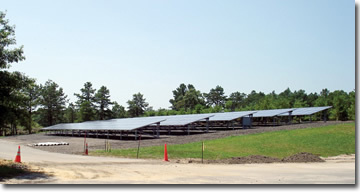 SunDurance Energy, a New Jersey company, was selected to do the Rutgers solar project. SunDurance looked to Yingli Green Energy to provide the PV modules. Once the university was sure they could capture the multiple benefits, the program moved ahead. But like any large project, there were challenges, and Calcado says that another university or company should be aware of them before committing to a similar endeavor. The first challenge was committing seven acres of land. Not every company or campus has that much land to commit, or wants to commit it. "You need to convince people that this is the right thing to do," says Calcado. In Rutgers' case, the land was in an area that wouldn't soon be developed. And Calcado says that even if it were to be developed down the road, the solar panels could be moved on top of buildings that are constructed-something the university can deal with. "The reality is that without their grants, this would not be economically feasible. So you really need to partner with them in order to maximize what's available that you can use." Calcado adds that there are a lot of dollars out there, it's just a matter of looking for them. For example, he says the federal government stimulus package passed earlier this year is probably a new source of money associated with these types of projects. Lastly, Calcado advises companies to know their technology. "Solar panels have been around a long time, but the technology has evolved. Be careful about what it is that you're getting in line for. And make sure that the engineers and consultants you're using are well versed." Solar Power for all in New Jersey? While the Rutgers solar project underlines the university's commitment to sustainability, it also clearly shows that New Jersey is one of the leading U.S. states when it comes to solar power. unveiled a $773 million proposal to bring the benefits of 120 megawatts of solar power directly to communities and customers throughout its service territory. PSE&G has proposed what it says is a unique and comprehensive "Solar 4 All" program, with a segment that includes the largest pole-attached solar installation in the country. The program will utilize brownfields and other underdeveloped properties for solar generation, and it is expected to result in savings to municipal and county budgets. and manufacturers to develop projects. In announcing the program, Ralph LaRossa, president and COO of PSE&G said, "We designed our program to ensure that everyone has access to the benefits of solar energy." It strongly supports New Jersey's aggressive renewable energy and environmental goals and intends to help strengthen the competitive solar industry in the state, he added. "By partnering with solar developers, we will bring solar projects online more quickly and cost effectively. We will also make solar energy available to every neighborhood in our service area, ensuring universal access." LaRossa said the program will encourage growth for the solar industry by providing financing and capital to build solar capacity in the current difficult economic times. The investment will help New Jersey address an expected shortfall in its current solar energy requirements. It will also generate hundreds of green jobs to help stimulate New Jersey's economy by training a pool of skilled workers who will be available for the entire solar industry. The PSE&G initiative would expand New Jersey's solar infrastructure and will satisfy nearly seven percent of the state's renewable portfolio standards requirements through 2020. He adds, "Everyone should do a thorough job with their homework. Many times, we tend to try to rush into these things, and that's not going to save anything in the end. So my advice is to always do a really thorough job of researching, given that these markets and technology change all the time." When it came to construction, Rutgers put out a Request For Proposals. Of the numerous companies that submitted proposals, SunDurance Energy of South Plainfield, N.J. was selected. The company designs, develops, and builds large-scale solar energy facilities for private and public entities. For this project, SunDurance looked to Yingli Green Energy to provide PV modules, which will have about a 25-year life span. The layout of the panels was an important piece of the project to capture the maximum amount of sunlight. "New Jersey is not the optimal place for solar panels, but it's good technology that works," Calcado says. SunDurance broke ground in September 2008, and the project came in on time and within budget. Calcado says there was a lot of excitement as it came together, and it went better than they anticipated. In April, when the project went live, the electrical power from the solar panels did not go on to a grid. Because of the university's sheer size (55,000 students, 660 buildings situated in five municipalities) it owns all of its infrastructure-substations, poles, transformers, and lines. The kilowatts generated each day will immediately be utilized to power a small portion of the university's approximately 12 million gross square feet. "Again, it's 1.4 megawatts and only 10 percent of what we use. It won't make the meter spin backwards," Calcoda laughs. Maintenance of the solar farm will be minimal. "Basically, just regular routine maintenance," says Calcoda. "The panels themselves don't need any maintenance, but the infrastructure surrounding it does." Being a university, the project will be fully monitored. "We partner with the academic departments relative to energy, utilities, usage, greening, and sustainability," says Calcado. Calcado believes educational facilities can be-and should be-leaders in implementing alternative energy. "I think that colleges and universities should be at the forefront of these types of endeavors. It's our responsibility to kind of set the bar," he says. "Because this is what we teach, we should be practicing it." Rutgers continues to research alternative energy uses. The solar farm will hardly be the last innovative project for Rutgers. In fact, they are currently looking at a combination of energy efficient tactics, including geothermal opportunities. "We're really excited about that," says Calcado. "Technology keeps changing every day. The difficulty is keeping up with it."